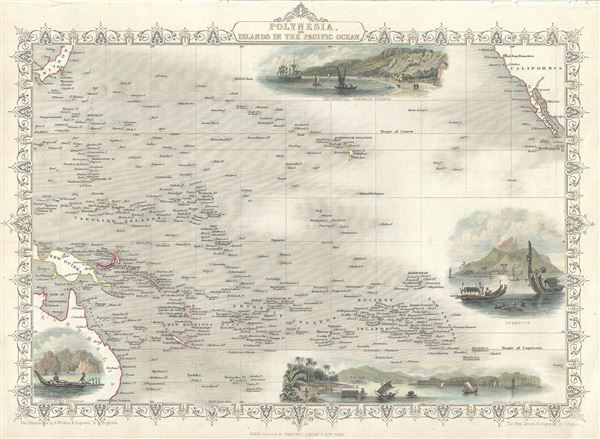 This is an impressive 1851 Tallis map of Polynesia or the Islands of the Pacific Ocean. It covers from Japan to California south as far as Australia and the Low Archipelago. Four inset views are included, featuring Resolution Bay, Marquesas, the Harbor of Dory, New Guinea, Otaheite and Kalakakooa, Sandwich Islands. The whole has a highly decorative presentation and the elaborate border distinctive of Tallis maps. The map was drawn and Engraved by J. Rapkin, with illustrations drawn by H. Winkles and engraved by T. Wrightson. This map was issued as part of the 1851 edition of John Tallis and Company's The Illustrated Atlas, And Modern History of the World. Rumsey 0466.057. Phillips (Atlases) 804.